There is a bad seed. He lies about pointless stuff. He cuts in line. Every time. He never washes his hands….or his feet. And he does lots of other bad things too. But what happens when a bad seed doesn’t want to be bad anymore? Can a bad seed change his baaaaaaaad ways? I am a bad seed. I’m ready to be happy. you’re so used to being bad. Generally speaking, a good book should not about “teaching lesson,” but it should prompt insight and reflection. 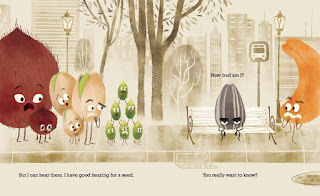 A Bad Seed is a simple picture book exploring a common cliché in a creative way. However, the truths it depicts are multi-faceted. The narrative begins with the bad seed repeating what others say about him. The attitude of parents and peers is clear, in spoken word as well as body language. 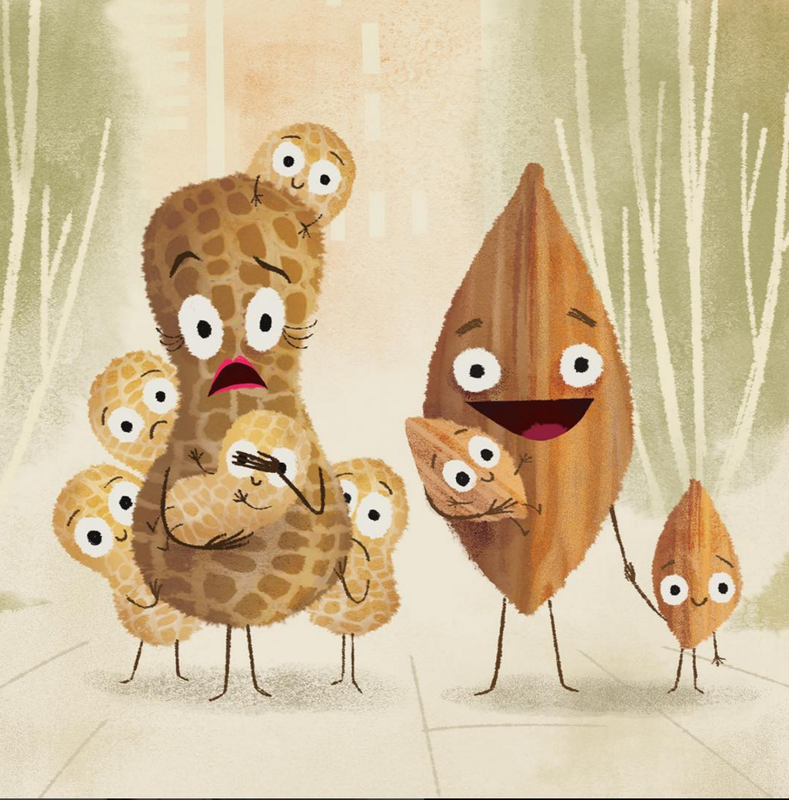 The seeds do everything from shield their children from the bad seed’s actions to expressing fear, dismay, and shock. They point at him and keep a distance. Illustrator Pete Oswald does a brilliant job conveying these emotions and others with simple drawings in muted neutral colors. 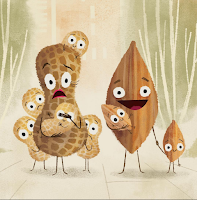 The book effectively depicts the impact of a group’s attitudes and actions on a person (or seed, in this case). 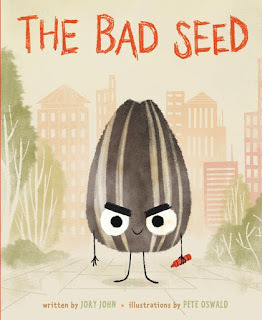 Next, the seed recounts all the “bad” things he has done. These awful deeds range from never washing his hands or putting things back to lying about pointless stuff and cutting in line. The reason he does these things: He is a bad seed. Sadly, he is convinced (like so many children) it is just who he is. The final contributing factor to his “badness” is experience. When he drops from a flower, he is raked up and put in a package of sunflower seeds. Then, he is almost eaten by a giant (a human). The seed allows his circumstances to jade him. 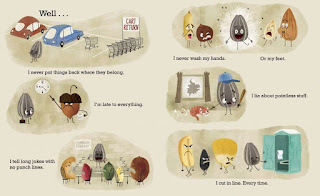 For a children’s book, so much truth is illustrated in those three layers. Truth vital for all ages: We cannot allow others to define us. We should not label and ostracize people who act differently. We are not inherently “bad” (or good for that matter). We decide how to respond to experiences—either to learn and to grow or to be bitter and to stagnate. There are multiple discussion possibilities from this one short picture book. The best part is when the seed makes a choice. He does not want to be bad anymore. With that choice comes changes in his actions. Eventually, the other seeds begin to see him in a new light. More importantly, he views himself differently. A Bad Seed defies the common belief that people are who they are. In other words, they cannot help how they feel, think, and act. To me, there is nothing more defeating than believing you are a tiger who cannot change his stripes. I love this book because it empowers children with the belief that they can change. It might be hard at first. They will have set backs. However, they can change with a commitment to shift their attitude and alter their actions. This books can be read and enjoyed by all ages. 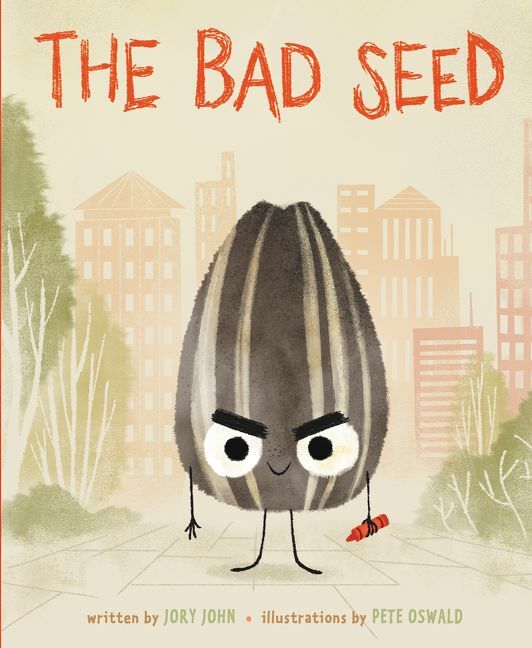 I highly recommend A Bad Seed to teach manners, self-reflection, empathy, and empowerment. Manners: The bad seed illustrates the impact of bad manners both on the him (the rule breaker) and others. Use the book as part of a unit on manners. Feelings: Identify all the characters' feelings in various situations. Connect feelings to actions and thinking. Choices: Discuss the bad seed’s choices and their impact on others. Ask children to consider their choices and impact—both immediate and long term (reputation). Even if they have a good reputation, they can hurt it with bad choices. Those with a "bad" reputation can fix it with lots of wise ones. Self-Reflection: For younger children, ask questions that prompt self-reflection: Am I acting ____ way? How do others feel when I ______? How can I change ____? For older students, parallel the story to their performance in a specific area. I teach writing. I could ask questions about how what others have said about their writing, what they say about themselves as a writer (self-talk), and how their experiences writing have impacted them. Then, move to the next part: How can they make changes to progress in their writing? Art: The bad seed comes from a sunflower. There are many sunflower activities online. This post has a Sunflower Hand Craft that is adorable. Clichés: The expression “a bad seed” is a cliché. Discuss what a cliché is. Expand to discuss other common clichés. Science: Use the book as part of a study on plants or seeds. Click here for suggestions on books about seeds. Reading: Click here for a reading of the book. Interactive Reading: Click here for an interactive reading session with the book. 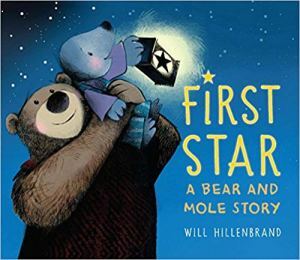 For more Perfect Picture Book suggestions, visit Susanna Leonard Hill's blog round up. This is such a multi-layered PB, as well as an entertaining read. I love this book. It gives kids lots to talk about, all those social interactions that can be so difficult to navigate in the real world are depicted quite well here. 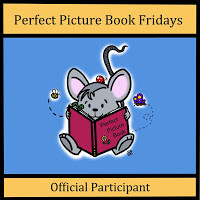 Good book with lots of great activities! This book sounds like a great classroom book. I must read it. Thank you for sharing MaiStoryBook's Interactive read loud of this fantastic book! I love how you helping to spread a love for reading! I hope everyone enjoys the interactive read aloud! Thanks for sharing your enthusiasm for books.